Evan Lewis occasionally blogs about Race Williams, classic Private Eye, and I’ve finally gotten around to reading one of his classic adventures: The Hidden Hand. The Hidden Hand is a secretive crime lord who has put a $50,000 bounty on Race Williams’ head. The adventures in The Hidden Hand were originally published in a different form in Black Mask back in the June, July, August, September, and October issues in 1928. Obviously, this is a fix-up novel, but for those of you who like your noir straight, then this Race Williams novel will take you directly to the Dark Side. Race Williams is tough as nails, gets gassed, manages to survive a sniper attack, and eliminates gangsters with ruthless efficiency. If you’re looking for action and violence, The Hidden Hand has plenty! This entry was posted in Uncategorized on August 10, 2012 by george. I read one Daly novel, THE SNARL OF THE BEAST. I don’t think I’ll be looking for others. I read SNARL OF THE BEAST decades ago, Jeff. 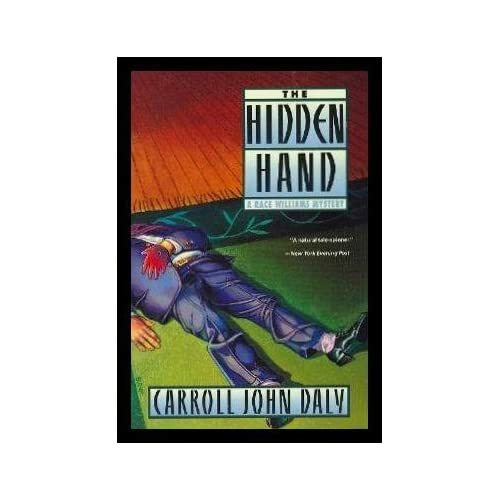 THE HIDDEN HAND features much of the same violence, but in a more satisfying plot. I’ve only read a few short stories but this attempt to a longer form (albeit a fix-up) sounds intriguing, thanks George. If you enjoy hard-boiled P.I. novels, Sergio, you’ll love THE HIDDEN HAND. I was sad to see that Harper reprinted only this and Snarl of the Beast (the first two Race novels). I assume the plan was to do all eight, but sales lagged. Everyone should read a couple of these, if only to see how far the private eye novel has come. I had no idea there were EIGHT Race Williams classics out there, Evan. If they show up as ebooks, I’d read them.